Q. What were the challenges involved in rolling out Pradhan Mantri Ujjwala Yojana (PMUY) throughout the country? Ans. Over 5 lakh (500,000) women lose their lives every year due to domestic pollution. Each and every woman spends hours trying to gather firewood in the forest — which is neither safe nor time efficient. When we started this program (Pradhan Mantri Ujjwala Yojana), we faced a unique challenge of providing LPG connections to 5 crore (50 million) below poverty line (BPL) women. Beneficiary selection was a challenge, along with wide-scale implementation and daily monitoring of the scheme. Another challenge was to ensure last-mile service delivery of the LPG cylinder — from the distribution centre to the house of the female beneficiary — and check whether it was installed with the right safety parameters or not. To sustain a scheme like this, you need information. You need a monitoring mechanism which tells you the ground reality. This is why we decided at the onset of the scheme to use a digital platform in the entire process, for accurate beneficiary selection, scheme monitoring and program implementation. We brought all these three stages on a digital platform. Q. How did data intelligence help you overcome these challenges? Ans. SocialCops was instrumental in assessing, analyzing and interpreting the data with high accuracy. They even helped us bring the data to a usable format. For the first time, it was possible for us to assess the scheme on a pan-India level. I was able to track all-India performance, and then break it down by specific states and districts. I had information around each LPG distributor’s performance at the district level. This last-mile information helped me identify which DNOs (District Nodal Officers) were performing exceedingly well, allowing me to reach out to them and motivate them to do even better. It is due to this digital monitoring that consumer information, right from the local distribution centre to Shastri Bhawan (in Delhi), was presented in a single, unified place. Q. How will data and technology affect governance in India? Ans. If we plan and implement a scheme based on mere guesswork and estimates, then certain gaps will show in our decision-making. With the use of numbers, data and technology, we can make important decisions in a matter of minutes. Data is going to become a primary medium for governance in India. Yes, data has been around, but it’s either been incomplete, based on a small sample or unfit for use. This is not acceptable anymore. Hon’ble Minister Dharmendra Pradhan and the Ministry of Petroleum and Natural Gas uses our data intelligence platform to optimize locations of new LPG distribution centres, track scheme progress across the country and and monitor every LPG connection installed. Read the full case study here! 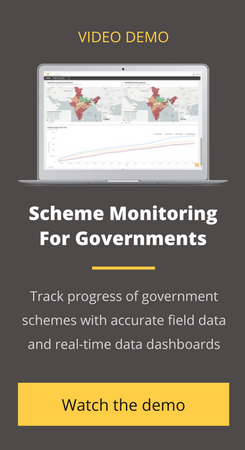 Want to learn how you can leverage the power of data intelligence for efficient scheme implementation, impact assessment and budget tracking? Learn more about our platform here!